It was sometime last winter that I first heard about “Pioneer Girl“, but from what I gathered, I’d be hard pressed to get my hands on it. Then, last March, Patience blogged about the copy she’d borrowed from the local library. I immediately put my name on the hold list and a few weeks ago, I finally got the notice my time had come. 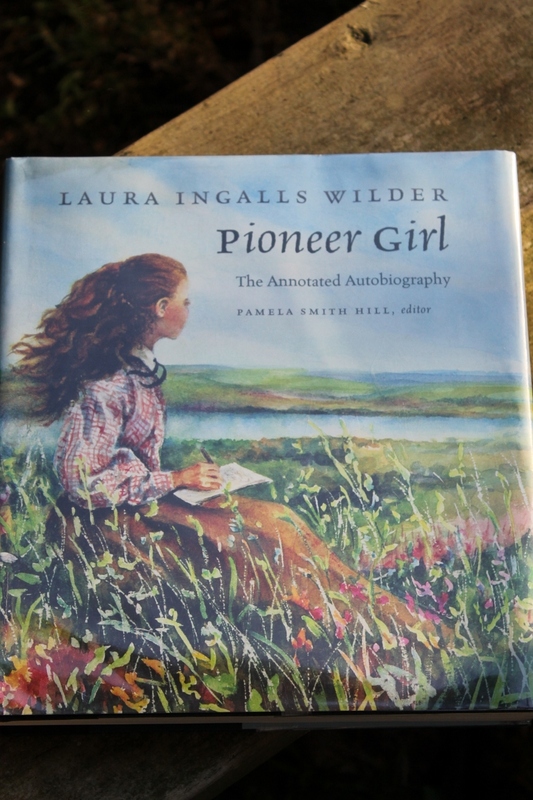 “Pioneer Girl” is the original memoir Laura Ingalls Wilder first penned about her life, growing up on the prairie with her family – Ma, Pa, sisters Mary, Carrie and Grace. Featuring a number of photos and some 800 annotations from scholars, it was originally written for adults and primarily Laura’s daughter Rose, herself a published author. With Rose’s help, this original manuscript became the basis for all the Little House books as we know (and love them). Laura had worked for years as a newspaper columnist, so her writing style at the time of this writing was somewhat different – she was used to having word counts and using economy of language – but here and there, her gift of being able to write life into a scene shines through. One can definitely see Laura’s writing beginning to shift in tone from her columns (I have a collection of them sitting on my book shelf that will now certainly come back out with some renewed interest) to the writer who captured so many little girls’ imaginations. I was apprehensive that it was going to take me a while to read through this hefty tome and that the annotations would distract from Laura’s writing. This was not at all the case – it was fascinating to read Laura’s accounts side by side with historical fact checking, not to mention pictures of young Manly and Cap Garland (and the entire Ingalls family, Reverend Alden and many more characters from the books). It was totally worth the 5+ month wait from the library. 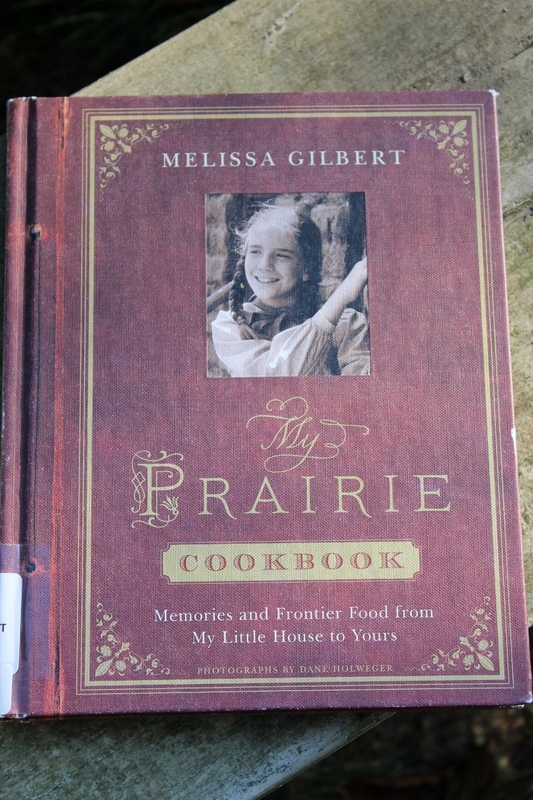 Melissa Gilbert, aka Half-Pint, the Laura Ingalls we grew up watching on the TV show, wrote a cookbook. Actually it’s part cookbook, part memoir and scrapbook talking about her days growing up playing Laura Ingalls. “My Prairie Cookbook” is a fairly decent little cookbook, full of good hearty prairie type meals. Turns out her cheat for doctoring a can of baked beans is pretty much the same as mine (who knew?) and her peach cobbler recipe, with a process much different than the one I typically employ, was a recent breakfast hit with the family. It was the perfect follow up book to “Pioneer Girl”, bridging the gap from life on the prairie in the 1870’s and 1880’s to life in Hollywood in the 1970’s before jumping into Kim Gordon’s “Girl in a Band“, but that’s a review for another post. Oh how exciting! Thank you for sharing this. I had no idea she wrote a book prior to the Little House series. I just might have to check this out!! This is what became the Little House series – it’s a little different in tone and what actually happened than the books and definitely the TV show. Fun thing! The editor of Pioneer Girl is the mother of one of my childhood friends! How fun! What a great project for her to have worked on! I’m so glad your turn finally came for Pioneer Girl! it’s such a great book. The Prairie Cookbook is also newly published? I will definitely be on the lookout for it. Yes, last fall I believe. I think it’s due back next week and I probably won’t be renewing it. I have got to get my hands on this. I think it will be fun to see the voice she wrote in originally against the “Laura books.” And however it worked out, they educated and inspired a legion of young girls and women, so that is remarkable anyway. The voice and the details – like what really happened to Jack the dog.